FACEBOOK PATENT TO SCAN YOUR FACE FOR EMOTIONAL REACTIONS…IS THIS MASS MANIPULATORS FOR REAL?? IT should come as no surprise that Facebook wants to become a literal version of itself at some point. That is to say, that your face would eventually make it into the social network in order to serve you content based on anything from your emotional state to expression. According to a few new patents uncovered by CBI Insights (though, never out of the public eye if you know where to look) this is exactly what Facebook wants to do. Pull your face into its messenger system, Face / Off style. Well, maybe not that brutally. The patents, applied for back in November of 2015 and granted last month are among hundreds (probably thousands) of patents that Facebook holds. The social network files patents on a pretty much constant basis, most of them are technical based and used to keep proprietary tech safe. That makes sense and is general practice for most tech companies. In between all the technical patents like Systems and methods for adding users to a networked computer system there are three that want to use your phone camera to take a good, hard look at your face. 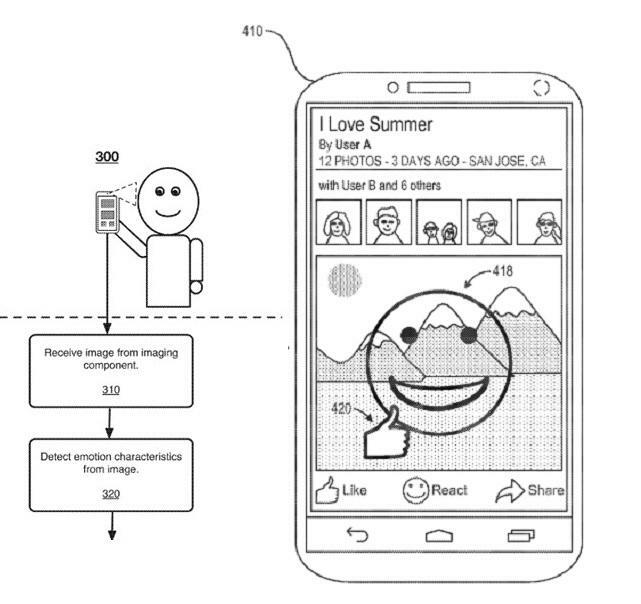 The first patent, Augmenting text messages with emotion information isn’t that creepy actually. It would solve a lot of issues we have with texting that the kids today don’t seem to understand — emotional subtext. This is something we generally use emojis for. This patent suggests a predictive system to add emotional information to text messages based on the methods of keyboard and other input devices. Typing speed, movement (using accelerometers), location and other factors would predict emotion and change the font text, size and probably just add a winky face or poo emoji. The last patent, Systems and methods for dynamically generating emojis based on image analysis of facial features does just that. It would capture real-time image data of your face through a selfie and send an emoji based on your face and gestures. This one seems more voluntary than the last for sure, as you’d be consciously choosing the option to send your face as an emoji. Why you’d want to turn yourself into an emoji is beyond me, but who am I to question progress? There are a bunch more patents that seem to support this type of facial recognition, but these three certainly stand out and will surely spark up a new privacy debate. Facebook, Amazon, Google, Microsoft and any company running any social or operating system software you use are already tracking your behavior to the best of their ability. Tracking your actual face is really just an inevitable escalation. As someone with a piece of electrical tape over the laptop camera, I can concur that these new patents foretell a very disconcerting future for privacy. We always have a choice though. You don’t have to let Facebook scan your face. You can just not use messenger. You can use SMS or Signal. Or you can complain about these changes in privacy, smile for the camera and send your face as an emoji so Facebook can glean insights into your constant emotional state for marketing purposes. Also, these are just patents — they may never physically reach fruition. As a Facebook spokesperson stated to me in an email, “We often seek patents for technology we never implement, and patents should not be taken as an indication of future plans.” So take it all with a hefty grain of salt. As with all features, this will be something you have to allow Facebook to do. You have to allow the use of your camera, but you are probably already doing that so you can take and add pictures to messages and posts. Will there be a separate opt-in option to allow Facebook to analyze your face? If not, that does pose a bit of a privacy concern. It’s one thing to consciously take a selfie and add it to a message, it’s another when Facebook is scanning your face through your camera when you want to send an ambiguous text message without subtext.